Home › Special educational needs and psychology › Bruner scores a century! Yes, Jerome Bruner, currently Professor at New York University, will turn 100 on October 1. And in the snappy headline to this blog, it’s his scoring (writing) which has been one of the main contributions to so many lives and disciplines in that time (only a third of a million mentions on the web!). I’m not going to attempt to write Jerry’s story in full, but I would like to use this occasion to highlight a few aspects. Jerry was born blind, but had sight restored by the age of two. We are hugely grateful for that. He has helped us see so much. He went on to study, and gained a PhD at Harvard in 1941, later leading the Harvard Center for Cognitive Studies. That gets called the cognitive revolution, because the study of the human mind flew in the face of behaviourism (A Study of Thinking, 1956). Creation of meaning is complex. It was the theme of adding meaningful complexity to our understandings which started then and has continued for decades in a range of disciplines. Thankfully, this included education and curriculum development (The Process of Education, 1960; The Act of Discovery, 1961: Towards a Theory of Instruction, 1966). Later he contributed to our understanding of context and the multi-level view of the individual, context, culture (The Culture of Education, 1996). This includes a chapter analysing “folk pedagogy”, which helps us identify stereotypical ideas about how learning happens, many of which are active today, including in the assumptions of politicians. That volume also reflected what is sometimes called “the narrative turn”. “A life as led is inseparable from a life as told” (Life as narrative, 1987). This perspective helps us humanly read the context we’re in and then identify new stories to create. In 1970 Jerry was offered a chair at Oxford, and sailed his boat across the Atlantic to get there, landing in Southern Ireland. He still enjoys Reenogreena. I love (to use a technical term) his style of writing: it’s so constructionist and connected with the reader. He’s taking an idea for a walk and wanting to do that explicitly with somebody. Example: “I would like to try out an idea that may not be quite ready, indeed may not be quite possible. But I have no doubt it is worth a try” (Life as narrative, 1987). Similarly: “Let me begin by setting out my argument as baldly as possible” (Narrative and paradigmatic modes of thought, 1985) – a chapter which transformed my thinking. Most recently he has been applying this stance to the dynamics of the law (Making Stories in Law, 2003). This also characterises his presentations/lectures. In 2007 when Oxford University decided to name one of their buildings after him, he popped onto the stage and said “This afternoon, I’d like to try out another idea for the future”. That session was titled “Cultivating the Possible”, a phrase which encapsulates much of his contribution. You can see a more recent contribution on YouTube (How does teaching influence learning? 2014). 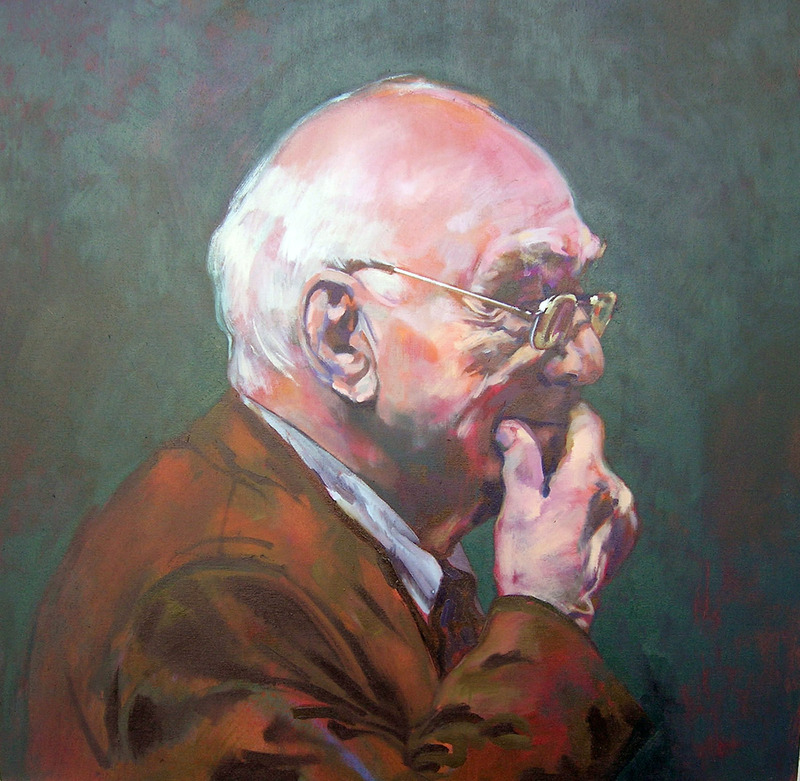 Portrait by Beth Marsden, at University of Oxford. jErome Bruner changed my life. His arguments about narrative understanding have informed all aspects of my teaching and learning and engagement with teachers since I first read ‘The Culture of Education’ in 1996 and ‘Acts of Meaning’. His earlier work based on research with young children in Oxford is similarly inspiring. How marvellous that he is alive and well. I was introduced to Jerome Bruner when I was studying for my M.Ed in 1974. He was then, and continues to be, the most influential academic on my thinking and practice. Visiting Harvard a few decades ago I knocked his door in the Faculty and was slightly relieved to know her wasn’t in as I didn’t know what I would say which was not entirely sycophantic. When moving to the other Cambridge in 2000 Bruner was given pride of place in my bibliographies and students continue to be inspired by the economy and power of his writing. A truly amazing contribution for which I extend grateful thanks!